Successfully Added Digital Camcorder (320x240) Beginners DV Camera to your Shopping Cart. 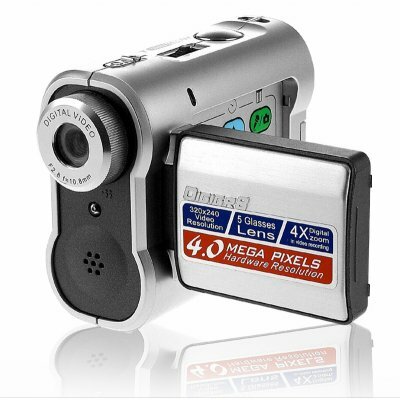 Digital Camcorder for taking 320 x 240 resolution videos and 4 megapixel photos. Compact sized beginners digital camcorder that records video in computer friendly 320x240 resolution for easy uploading to your favorite website, emailing to friends and family, or storage on your computer. This impressive beginner's camcorder can also take up to 4MP pictures with a variety of quality settings for indoor or outdoor photography. This unit also features a convenient 1.5 inch flip-out TFT color LCD for viewing while shooting and the use of off the shelf AA batteries (easy to replace when needed with no need to buy expensive proprietary batteries) and uses uses SD/MMC cards up to 1 GB for storage. This camcorder/digital camera is ideal for a first-time user because of its ease of use combined with a above average feature set for a beginner level DV camera. This model is in stock now for single piece or stock orders.